Can you tell when someone is confident? What difference does confidence make? Do you need it be successful? Confidence is fluid in life and there are times when we feel confident and times when we don’t. So why is it important to have it? Recently, I asked a group of children what confidence was and what difference it makes. When you read their responses having confidence sounds vital in order to cope with many parts of everyday life. What occasions do we lack confidence? Can you name one? All of these occasions have common concerns for us and that is why they are popular as times when we lack confidence. Firstly, they require us to be ourselves, what we do and how we respond is up to us and no one else. We can’t hide behind anyone or follow others and copy what the majority do. Secondly, they are all occasions we are unsure about what will happen, what will they ask, who will be at the party, what will happen…. Standing up in an interview or walking into a new event requires us to step out of our comfort zone and make our own decisions. Often we don’t like it because we feel we don’t know what to do, what to say or how to behave. The good news,,, this can be overcome. You can learn and practice techniques that help you prepare so you walk into any situation feeling more relaxed, and of course confident. The difference that having confidence gives is it allows you to live your life more successfully. Being confident results in more success in exams, more profits in business, more successful career paths and makes for better leaders and better communicators. 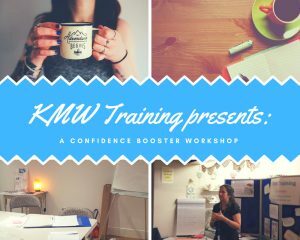 Seeing the difference having confidence makes to an individual, KMW facilitate ‘Confidence Workshops‘ regularly. The workshops are very relaxed and teach the essential techniques to unlock your inner confidence.